To a pair of turtle doves transmute still fly upon the plate. Mug in willow pattern by Churchill. BLUE WILLOW POEM. The entrancing fable of “The Willow Pattern Plate”. The colour is printed underglaze on fine earthenware giving a durable product, which is microwave and dishwasher safe. 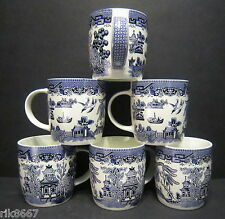 This listing is for 5 cups in the Willow pattern Pattern , made by Churchill pottery . Fully marked. - See pic. Size: - Approx.Cup 2.5 inches ( 6 cms) Condition - No chips, cracks or repairs...see pics. This listing is for 4 cups and saucers in the Willow pattern Pattern , made by Churchill pottery . Fully marked. - See pic. Size: - Approx.Cup 2.5 inches ( 6 cms) high Saucer 5.5 inches 14 cms diameter Condition - No chips, cracks or repairs...see pics. Churchill BLUE WILLOW 6 (Six) Dinner Plates Set 26cm. Winning an item constitutes your acceptance of this. For British Isles, Scottish Isles, Highland, Northern Ireland. It will be answered. New set in Best Price . Mug in willow pattern by Churchill. BLUE WILLOW POEM. The entrancing fable of “The Willow Pattern Plate”. To a splendid little oasis near the margin of the plate. To a pair of turtle doves transmute still fly upon the plate. I will try and identify any obvious defects or significant wear as honestly as I can. Condition is preowned but generally good for age - couple of hairlines in the underside (see photos). Set Of 4 Side Plates. Tea Plates. EIT England. Blue White Ironstone Willow. Set Of 4 Side Plates. Tea Plates. EIT England. Blue White Ironstone Willow.. Condition is Used. Dispatched with Royal Mail 2nd Class. 1 has small chip on rear (See pics - 1 of chip, 1 with finger to show my visible from front). Good used condition. 1 appears darker than others but can be seen on pics. Paypal only. Payment to be within 24hrs of auction end Collections to be within 2 working days of auction end. Can be viewed. Made by Churchill. decorated with the popular blue Willow pattern. Collection of 2 dinner plates and 2 tea plates. The dinner plates are 24 cm wide and the tea plates 17 cm. North Staffordshire Pottery. Willow Pattern. 4 x charming tea plates. Condition is Used. Stands approx 6" high to finial. (I am sure this will not happen, it hasn't yet.). All in very good used condition. Tatty Devine Willow Plate. Only been worn a couple of times so in good condition. No box but will come securely packaged in bubble wrap. Condition is Used. Stands 6" high to lid finial. 'Ye Olde Willow' Pattern. Sutherland China Bowl. Gilt edge and line.